I just got this press release from the Wisconsin Historical Society Press, looks like great summer reading for Wisconsin gardeners. Culture and history can be passed from one generation to the next through the food we eat, the vegetables and fruits we plant and harvest, and the fragrant flowers and herbs that enliven our gardens. 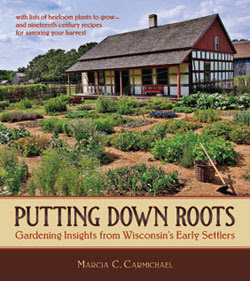 "Putting Down Roots: Gardening Insights from Wisconsin's Early Settlers" ($24.95, ISBN: 978-0-87020-466-1) reveals how the plants our ancestors grew tell stories about their way of life. When European immigrants and Yankee settlers arrived in Wisconsin in search of a better life, they brought with them a range of agricultural and culinary traditions reflective of their diverse heritages. With "Putting Down Roots," historical gardener Marcia C. Carmichael offers a window into the lives of our ancestors as she details numerous heirloom plant varieties, authentic ethnic recipes, cultivation techniques and tools, and folklore tidbits employed in the kitchens and gardens of early Yankee, German, Norwegian, Irish, Danish, Polish, and Finnish immigrants. A visually inviting slice of cultural history, "Putting Down Roots" is also a practical guide to the gardens of 19th century ethnic newcomers for today's sustainability-minded heritage gardeners. Featuring the recreated 19th century heirloom gardens at the Wisconsin historic site Old World Wisconsin, "Putting Down Roots" is a story of holding fast to traditions while adapting to changed circumstances in an adopted home. "In a time when people are increasingly concerned about organic gardening practices and the need for more variety in our plants for the health of the planet, Carmichael shows readers the value in drawing from the past for the good of the present. For avid gardeners and simple admirers of other people's gardens alike, 'Putting Down Roots' is an absorbing book of Wisconsin's history and culture." -Jennifer Fandel, "ForeWord Reviews"
Marcia C. Carmichael is the historical gardener at the 576-acre Old World Wisconsin, the largest of the Wisconsin Historical Society's living history museums, where she exercises her passion for historical accuracy and enjoys the research as much as the design, creation, and nurturing of the museum's heritage gardens. She supervises and works alongside a dedicated group of historical garden volunteers to create period-appropriate gardens and enjoys all aspects of heirloom plants, from propagation to harvest and from folklore to fact. Watch Marcia Carmichael in the book trailer for "Putting Down Roots"! Why I garden; and why do you garden?